This Fishie prey really brings out the natural hunting instinct of your Cat. Cats go completely Crazy for this refill! Size approximately 4.5cm long x 3cm high in body plus 8cm Feather tails. With the Wands, you can put life into the toy, so that the target at the end of the string can wiggle, creep, fly or dart around the room, or garden. Your cats' speed and grace will amaze you as they dash around trying to capture the prey! Simply clip on to play! Individually Handmade. No Plastic! Leather core. Colourful with yellow Green and Orange patches. Handmade in UK from UK birds leading a natural outdoor life before entering the British food chain. Fixed by a special tubing to stop the feathers coming out. 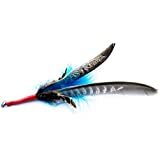 The feathers spin through the air simulating a flying bird your cat can't resist! Various colours and size of feathers. Simply clip on to the rods to play! Another fantastic attachment for fun play time with your cat! Simply clip on to play! Please note - The Chenille fabric used is very soft and it is to be expected that tuffs will become detached or ripped from the wormz cord core. How long they stand up to wear and tear really depends on the cat involved but whether your cats destroy their worm in a few days or it lasts for months they will have fantastic fun and games with them. Part of the realistic "Bug" Range, it attaches to the end of the wands imitating a colourful bug. If your cats like to chase Dragonflys , this is the refill for them! 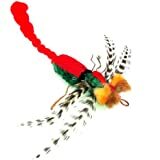 Realistic Dragonfly size approx 5cm long x 1.5cm in body plus wing span of 5cm each wide and long 7cm bright yarn tail. Size approximately 7cm long x 4cm high in body plus feather wings & tails. With the Interactive Wands, you can put life into the toy, so that the target at the end of the string can wiggle, creep, fly or dart around the room, or garden. Your cats' speed and grace will amaze you as they dash around trying to capture the prey. Part of the small realistic "Bug" refill range, The Locust creeps and sneeks as you pull it along the floor using the wands. Make it hide in boxes or under furniture for your cat to pounce on. If your cats like to chase small Insects / Grasshoppers etc , this is the refill for them! Simply clip on to play! Individually Handmade. Various Colours. Polywog refill really brings out the natural hunting instinct of your Cat. Cats go completely FrenzyCrazy for this refill! 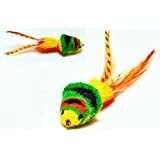 Size approx 3.5cm ball body plus ave 8cm long Feather tails. If your cats like to chase Spiders, this is the re them! The House Spider creeps and sneeks as you pull it along the floor using the wands. Make it hide in boxes or under furniture for your cat to pounce on. Simply clip on to play! Brown Colours. Individually Handmade. Froggie refill really brings out the natural hunting instinct of your Cat. Cats go completely Crazy for this refill! 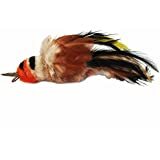 Size approximately 5cm long x 3cm high in body plus Feather tail. Simply clip on to play! Individually Handmade. No Plastic! Leather core! Colourful with yellow Green and Black patches. Size approximately 6cm long x 3cm high in body plus feather wings & tail. With the Interactive Wands, you can put life into the Kakapo, so that the target at the end of the string can wiggle, creep, fly or dart around the room, or garden. Your cats' speed and grace will amaze you as they dash around trying to capture the prey. If your cats like to chase Spiders, this is the re them! The Tarantula creeps and sneeks as you pull it along the floor using the wands. Make it hide in boxes or under furniture for your cat to pounce on. Individually Handmade from CHENILLE fabric and real fluffy feather legs.. Simply clip on to play! Add a bit of variety to your clip end Interactive rod toys with this fun attachment! These Fishie attachment - Clips on to the PurrSuit, Frenzy & Da Bird Cat Toys wands *Realistic hair toy activates your cat's hunting instinct *Cats go crazy with this refill! *You need to hide it away while not in use!! The Fishie refill is made from 100% genuine reindeer hair. Similar to British Sheepskin, The hair is a by-product from free roaming outdoor reared herds from Finland and are protected under Finland's Animal Welfare Laws and The Finish Reindeer Herding Council. Made with the hair securely fixed to a soft leather core running through the middle (No sharp metal bar like other brands) The connection to the wand toy is via a braided strong cord hook on the front securely fixed This is the attachment - Clips on to the PurrSuit, Frenzy & Da Bird Cat Toys wands Every cat has an inbuilt natural hunt instinct, ( it's what they are made to do! ) and need to hunt to lead a happy fulfilled life. Purrs make natural hunt toys. SAFETY !! Cat teaser/Interactive toys are NOT chew toys. Cat Interactive & Teaser Toys satisfy your cat's natural hunt & chase instinct. They are designed only for human supervised interaction with your cat(s) to encourage cats to play and exercise. All the interactive toys should be put away when the play sessions are over. They should never be left with your cat to chew or destroy (as s/he would actual live prey) or left in a place where your cat can reach them without your participation. This is to protect your cat from injury and to make sure that the toys keep their strong appeal. To complete a cat's natural hunt, catch, kill, eat cycle, use the Frenzy wand and refills as hunt/chase exercise toys and some real feathers for the kill instinct and cat treats for afterwards to complete the cycle.